Anaemia is not disease but a manifestation of an underlying disease. The list of diseases causing anaemia is exhaustive. The list includes disease as innocuous as a nutritional iron deficiency or as serious as a leukaemia or iron deficiency from a colonic cancer. Every patient of anaemia must have a complete evaluation. Failure to do so may may delay the diagnosis of serious diseases like cancer. Figure 1 gives the outline for evaluation of a patients with anaemia. The details of evaluation are given below. Red cell transfusions in anaemic patients are for relieving symptoms due to a low haemoglobin. Patients without symptoms should not be transfused. A pre-transfusion serum sample should be stored to perform tests likely to be affected by blood transfusion (e.g. serum ferritin, serum B12, serum folic acid and haemoglobin electrophoresis). Apart from risks associated with transfusion the relief of symptoms following transfusion reduces the patient’s and the doctor’s zeal to pursue a complete diagnosis. The history, examination, haemogram and red cell indices are available in all anaemic patients. This information gives a reasonable idea about the cause of anaemia. A diagnosis can be made with a few additional investigations. No patient should be treated without a complete diagnosis. Iron deficiency is the commonest cause of anaemia. It may be a result of an innocuous cause like nutritional iron deficiency or may be a manifestation of a serious underlying disease like a cancer of the gastrointestinal tract. Most patient of anaemia will respond to iron supplementation. Iron supplementation without complete investigation of anaemia is a common but dangerous practice as it may delay the diagnosis of dangerous underlying illnesses like colorectal carcinoma. 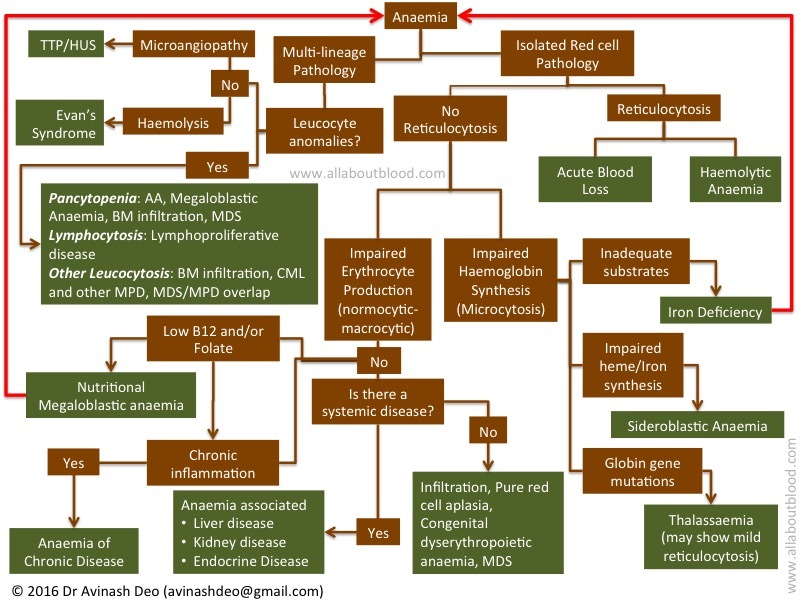 Clinical manifestations of anaemia result from manifestations of impaired oxygen deliver, manifestations of the underlying disorder and manifestations due to compensation to anaemia. The body adapts to anaemia by increasing cardiac output, redistribution of blood from non-critical to the critical circulations and the and increased oxygen extraction (see Pathophysiology of anaemia). These adaptation occurs slowly. Patients with a gradual fall in haemoglobin can tolerate a more severe anaemia than a patient who become anaemic rapidly because they get time to adapt to anaemia. Vascular disease results in the patient becoming symptomatic at a higher haemoglobin level. These patients manifest with ischaemic symptoms of the region supplied by the vessel. A patient with a gradually developing anaemia and without coronary heart disease becomes symptomatic at a lower haemoglobin than a patient who develops anaemia rapidly or one having a coronary artery disease or one having both. Nutritional anaemias have a slow onset and thus present with a lower haemoglobin than anaemia or blood loss or acute haemolysis. If one sees a patients who is asymptomatic with severe anaemia one can be fairly certain that the patients suffers from nutritional deficiency. If the haemogram shows microcytosis the anaemia is likely to be due to iron deficiency. If there is macrocytosis the anaemia is likely to be due to B12 or folate deficiency. Manifestations of anaemia are a result of impaired oxygen delivery. In patients without a significant coronary compromise the symptoms of anaemia include fatigue, lightheadedness and breathlessness. Frank cardiac failure sets in as the severity increases. Ischaemic symptoms, typically angina pectoris, may predominate in patients with significant coronary narrowing. Pallor, the most prominent sign of anaemia is of less diagnostic use than it is percieved to be. It has been reported to have a sensitivity of 19% to 70% and a specificity of 70% to 100%. There is inter-observer variation and clinical examination can not exclude mild anaemia. There have been suggestions that the tongue is the best site for diagnosing anaemia others have differed (PLoS ONE 5(1): e8545. doi:10.1371/journal.pone.0008545). Lack of pallor does not exclude mild anaemia and a haemoglobin assessment must be done is every patient with suspected anaemia. The table below gives clinical features that may give a clue to the nature of the disease causing anaemia. Achloruric Januduce: Achloruric jaundice is a result of increased haemoglobin catabolism (see haemoglobin catabolism) It is seen in patients with haemolytic anaemia and megaloblastic anaemia. In haemolytic anaemia the source of haemoglobin is erythrocytes and in megaloblastic anaemia the it the haemoglobinized erythroid precursors that are destroyed as a part ineffective erythropoiesis. The presence of reticulocytosis in haemolytic anaemias (see diagnosis of haemolytic anaemia) as opposed to reticulocytopenia megaloblastic anaemia differentiates the two conditions. Every anaemia with achloruric jaundice may not be a haemolytic anaemia or megaloblastic anaemia. Gilbert’s syndrome is a common asymptomatic defect of bilirubin metabolism that may co-exist of anemia of another cause. Rarely achloruric jaundice with reticulocytosis may be seen in large occult haematomas. Haematomas of the retroperitoneal region may present in this manner. Chloruric Jaundice: Patinets with haemolytic anaemia may develop chloruric jaundice because of biliary obstruction from pigment stones. Nail Changes Platonychia (flat nails) and koilonychia (spoon shaped nails) are features of iron deficiency. These changes may be congenital and the duration of the changes must be enquired into. Subacute Combined degeneration of the Spinal Cord: Subacute combined degeneration is a myelopathy caused by B12 deficiency. It presents with parasthesiae of the upper and lower limbs that progress to weakness and ataxia in untreated patients. Vibratory and joint position sense is lost early in disease and progresses to impaired pinprick, light touch and temperature sensations. Upper motor neuron involvement results in hyperreflexia of the knees but the ankle reflexes are depressed due to a co-existing peripheral neuropathy. Plantars reflexes give a extensor response. Rarely features of autonomic involvements may be seen including orthostatic hypotension and bladder and bowel incontinence. Neuropathy: Chronic lead poisoning is characterized by a peripheral neuropathy that manifests with motor disturbances with few sensory symptoms. Other Neurological Manifestations: B12 deficiency can rarely cause cognitive or psychiatric manifestations (3%) or bilateral optic neuropathy and blindness (0.5%). Exposure to lead can cause encephalopathy. Cardiovascular: Tachycardia, wide pulse pressure and decreased exercise tolerance result from cardiovascular compensation to anaemia. Musculoskeletal: Chronic haemolytic anaemias result in marrow hyperplasia. Marrow hyperplasia causes typical facies and increased risk of fracture. Facial features include bossing of the skull hypertrophy of the maxilla resulting in exposure of upper teeth, prominent malar eminences with depression of the bridge of the nose, puffiness of the eyelids and a mongoloid slant of the eyes. If the pathology involves only the red cells or is there involvement of the white cells and /or platelets. Alterations in more than one cell lines of blood cells occurs because blood cells share precursors, developmental microenvironment and antigens. Diseases involving more than one series of blood cell include. Diseases of haemopoietic precursors: Aplastic anaemia, Acute leukaemia, myeloproliferative diseases, Myelodysplastic syndrome, Myelodysplastic syndrome/myeloproliferative neoplasm. All the above diseases other the TTP/HUS need a bone marrow examination for diagnosis. TTP/HUS is characterized by microangiopthic haemolytic anaemia in a patients with characteristic clinical presentation. Anaemia induces erythropoietin production. Erythropoietin stimulated red cell production. Increased erythrocyte production manifests as reticulocytosis (see reticulocyte count). Reticulocytosis in an anaemic patient indicates that the anaemia is because of erythrocyte loss and the bone marrow is normally responding to anaemia. Patients with erythrocyte loss may fall into three catagories. Acute blood loss: These patients give history of blood loss and present with anemia with reticulocytosis without evidence of haemolysis. Chronic Blood loss: Blood loss is a alarming symptom that prompts patients to immediately seek medical advise. Patients with occult blood loss, those with altered blood loss or those with not capable of recognizing a blood loss may present with manifestations of chronic blood loss. Chronic blood loss causes iron deficiency. Unlike acute blood loss the manifestations of chronic blood loss are those of iron deficiency anaemia (microcytic anaemia with reticulocytopenia). Haemolytic anaemia: Patinets who have anaemia with reticulocytosis but have no demonstrable blood loss should be considered to have a haemolytic anaemia. As haemoglobin forms about 97% of the erythrocyte proteins. Disorders impairing haemoglobin synthesis cause microcytic anaemia. Haemoglobin synthesis needs an functional genetic code, normal heme synthesis, adequate supply of iron and proper incorporation of heme in haemoglobin. If any of these are defective a microcytic anaemia develops. The commonest cause of microcytic anaemia is iron deficiency. The first investigation in a patients of microcytic anaemia is assessment of serum iron, total iron binding capacity and serum ferritin. 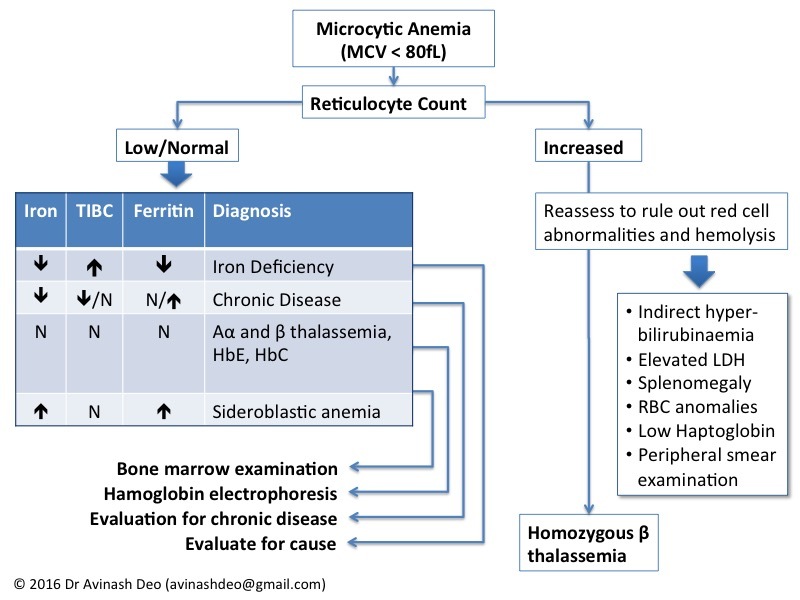 The results of iron studies microcytic anaemia are depicted in figure 3. Further evaluation of patients depends on the result of iron studies. If the irons studies are normal then an study for abnormal haemoglobin should be performed either by HPLC or cellulose acetate electrophoresis in alkaline pH. Patients with HbA2 between 3.5-7% have heterozygous β-thalassaemia. Higher HbA2 values should be considered to be due to an abnormal haemoglobin that separates with HbA2 (e.g. HbE). Patients with homozygous and heterozygous HbE disease may be diagnosed in this manner. Those with a normal hemoglobin electrophoresis are likely to have α-thalassaemia trait. α-Thalassaemia needs estimation of globin chains synthesis. This investigation may not be readily available. If HbH disease is prevalent in the ethnic group the patients belongs to, it is essential to compete evaluation for α-thalassaemia to prevent Bart’s hydrops fetalis. Patients with transferrin saturation more than 50% need to have bone marrow aspiration for diagnosis of sideroblastic anaemia. Patinets with normocytic anaemia need to be evaluated for liver disease, renal failure or endocrine disease. The endocrine disease associated with anaemia include hypothyroidism, hyperthyroidism, adrenal insufficiency and hypopituitarism. If these disorders are not found the iron status should be assessed. Patinets may have iron deficiency (transferrin saturation <16%), anaemia of chronic disease (transferrin saturation ≥16% with a low total iron binding capacity). A bone marrow aspiration should be performed in whom diagnosis can not be made by the above investigations. Macrocytic anaemias may be megaloblastic or non-megaloblastic. Features of megaloblastic anaemia include hypersegmentation of neutrophils, macroovalocytosis, indirect hyperbilirubinaemia and markedly elevated lactate dehydrogenase levels. Macrocytosis is pronounced and almost all patients with an MCV > 110fl have nutritional megaloblastic anaemia, are of antiviral therapy or on chemotherapy. The converse is not true. Patients of megaloblastic anaemia may have a MCV <110fl in early disease or in the presence of co-existing iron deficiency. Serum iron levels are increase in nutritional megaloblastic anaemia. They fall rapidly within 24-48 hours after therapy. Iron studies should be performed after a few days after administration of vitamins when the iron levels have stabilized. 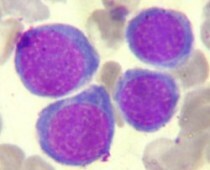 Nonmegaloblastic macrocytic anaemias are seen with alcoholism, hypothyroidism, liver disease and myelodysplastic syndromes. The images were not showing up because of a wrong URL. I have made the corrections and the images are seen. Thanks for pointing out the error. The TIBC in iron deficiency anemia is actualy incresed right? The arrow in the box above is given as decresing..
You are right. Sorry for the typo.